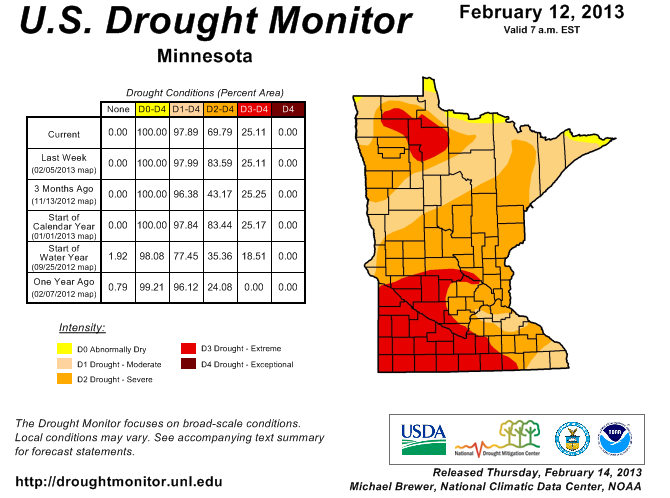 Minnesota Drought Update – Good News? There is positive news in the long range drought outlook, and hopefully the active weather pattern of frequent storm systems stays consistent through late winter into spring. The US Drought Monitor provides a weekly update to overall drought conditions. Today’s drought status doesn’t show much improvement across Minnesota, nor should it, but recent trends in regards to precipitation have been good. Below is today’s updated drought monitor. Note that while 100% of Minnesota is in drought, there’s been a marked decrease in percent area in severe to extreme drought (D2-D4). There is usually minimal change this time of year since our moisture is either not present or sitting on top of the ground in the form of snow. Recent rainfall has actually helped a little, even though we’ve got a deep frost layer. Minnesota along with much of the Midwest are in a long term drought, so relief from this drought will be a long process. 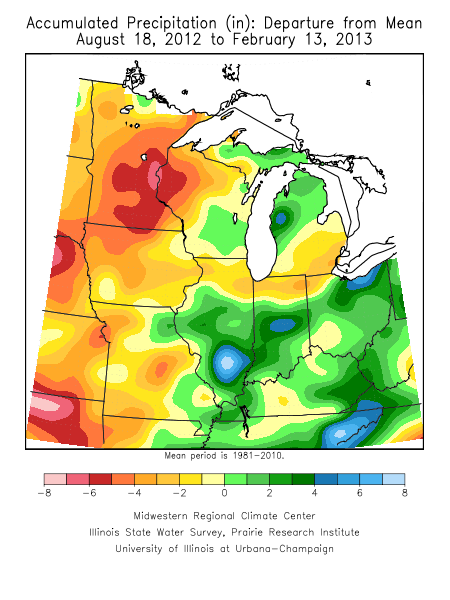 You can see there is a considerable moisture deficit over the past 6 months, and precipitation deficits actually stretch all the way back to August of 2011. 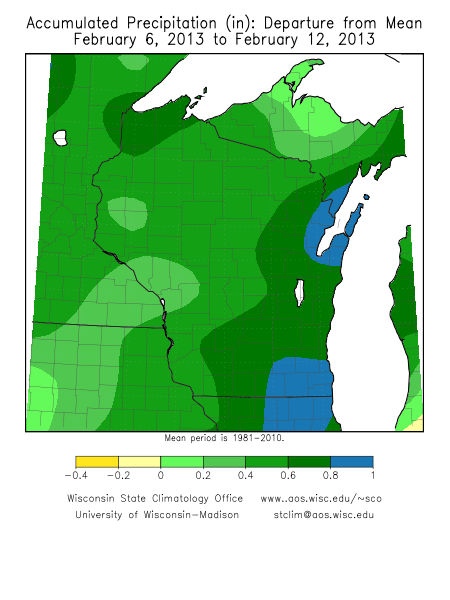 In that 18 month period, precipitation deficits range from 5 to nearly 20 inches across southeast Minnesota reporting stations. On a positive note is the recent precipitation trending above normal for winter, even if snow has been below normal, we’ve had unusual amounts of rain for winter. 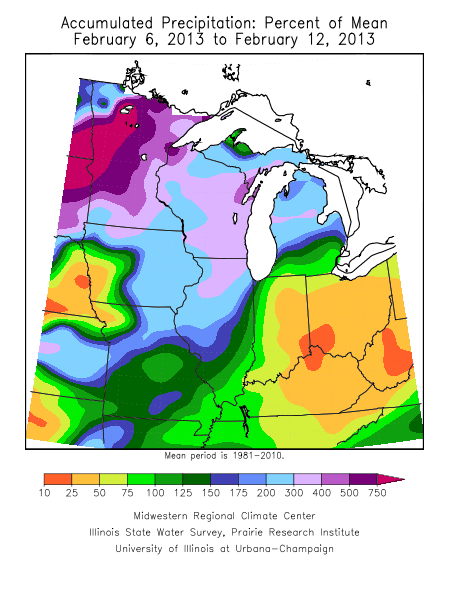 Call it what you will, but it’s moisture, and the middle of winter is typically the driest time of the year for us. Hopefully trends continue. 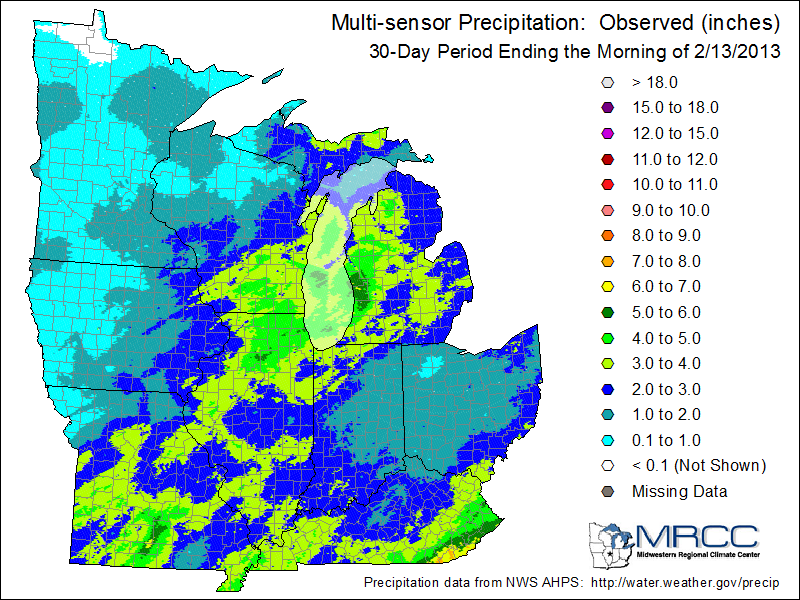 Images below show the departure from normal in the last week and the amount of precipitation in the last 30 days. 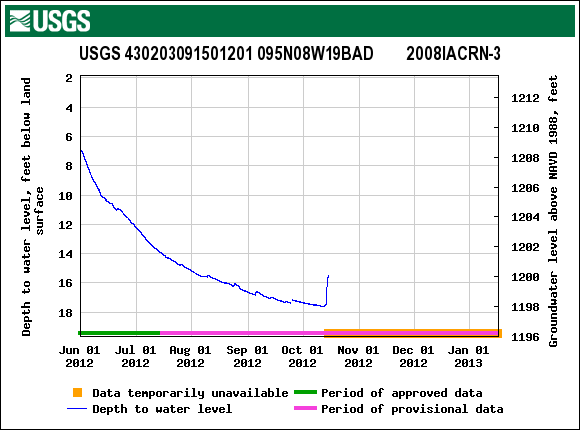 And the groundwater monitored is finally making a comeback after the lowest recorded level in that station’s history. I’d have put a southeast MN station on here, but levels haven’t been updated since November. This entry was posted in Uncategorized, weather on February 14, 2013 by Randy.